The Weber Master Touch is the classic Weber Kettle loaded with all the bells and whistles. Added into this 22.5-inch diameter charcoal grill is Weber's Gourmet BBQ System which has a removable round center section which can be replaced with any of Weber's custom accessories including a pizza stone, wok, griddle, and much more. 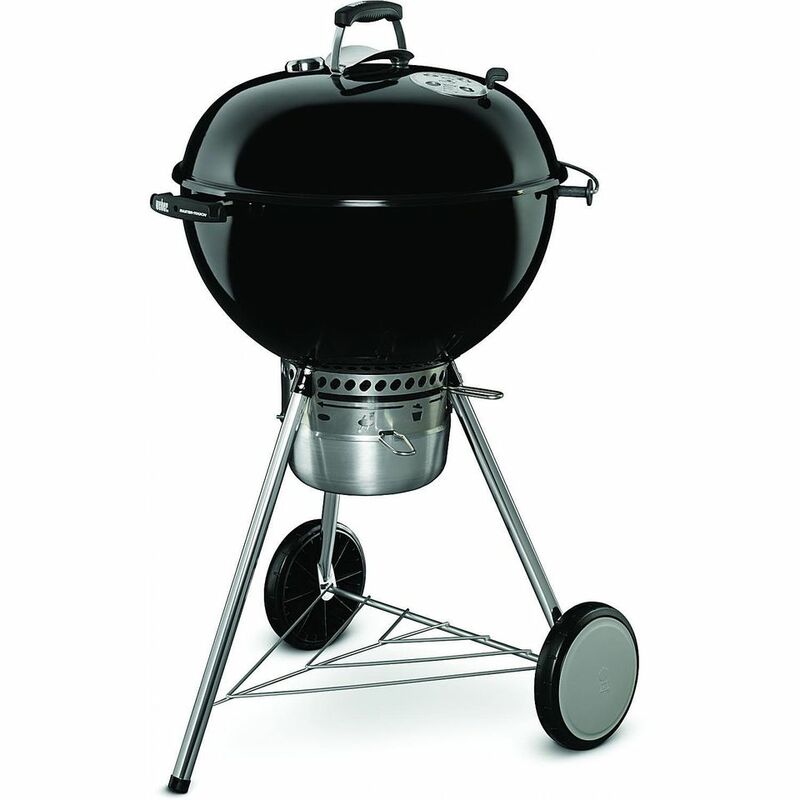 This grill also has the large charcoal catcher with an easy clean system, a roll top lid, and built-in thermometer. This is every extra feature that Weber makes in a three-legged charcoal kettle grill. All for around $200USD. Years ago the pinnacle of the Weber Charcoal Grill line was the Master Touch. Then they discontinued it in favor of the table mounted performer grill. Now, for 2015, Weber has reintroduced the Master Touch Charcoal Grill. Basically, the standard three-legged charcoal grill loaded with all the extras Weber can fit into a charcoal grill. At around $200USD this grill fills out the Weber line sitting between the 22-Inch Original Kettle Gold ($150USD) without the accessories and the Performer Silver ($250) that comes on a cart with a fold down side table. What this charcoal grill offers in addition to their deluxe charcoal grill features (large ash catcher and built in thermometer) is a roll away lid holder so that the lid can be simply slid off the grill and Weber's Gourmet BBQ System cooking grates. This steel plated, hinged grate has a removable center section that can be replaced with a wide range of accessories to give the grill greater versatility. From the pizza stone to an Ebelskiver pan. Of course, all these accessories are sold separately and range in price from $35USD to $55USD. The real reason to choose this version of the ever popular Weber Kettle Charcoal Grill is for all the accessories. If you are not interested in doing anything more than basic grilling, can buy your own pizza stone, and perhaps experiment with a little smoking, then I would recommend buying a different model. If, however, all that versatility sounds intriguing, then this is probably the perfect charcoal grill for you.